Spartans attend the 2017 SkillsUSA Fall Leadership Conference. 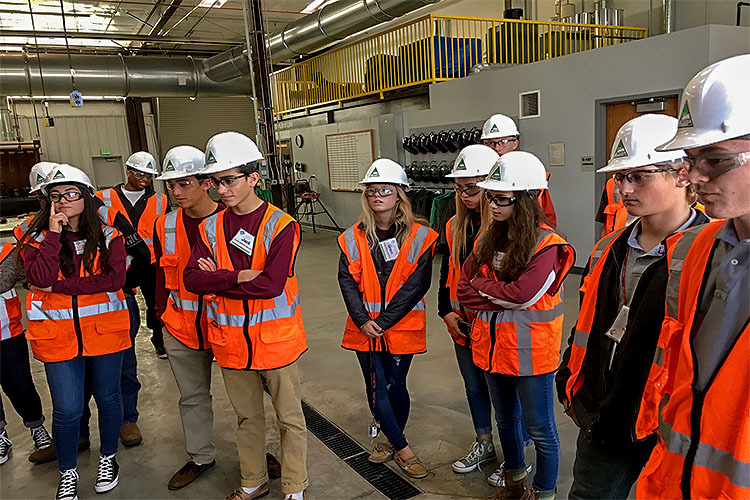 On October 11, CCT teacher Jerry Esparza took six TJ students to The Industrial Company (TIC) Training Center in Aurora, Colorado, for this year’s SkillsUSA Fall Leadership Conference. TJ’s chapter officers were personally invited to the conference, while chapter members had an open invitation. Chapter Presidents and seniors Avery Hericks and Katie Schroeck, Vice President and senior Conner Side, Secretary and senior Grace Leonard, Public Relations Officer and junior Jack McCord, and chapter member and senior Maia Freedberg had the opportunity to gain leadership skills to better themselves for their big year in SkillsUSA. Schools from across Colorado attended the conference, allowing TJ to not only learn from the speakers’ presentations, but also from other SkillsUSA chapters across the state. “It was interesting to hear about how other schools get involved within their communities through fundraisers, community service projects, and social events through SkillsUSA,” Hericks explained. SkillsUSA is a nonprofit organization that aids high school and college students in preparing for careers in trade, business, and technology. The chapter at TJ has been active for the past ten years, led by Esparza. “[SkillsUSA] provides resources and curriculum to help students develop skills to become leaders and develop soft-skills for the workplace,” Esparza said. Students within TJ’s chapter organize community service projects, public events, and work in public relations. While all of Esparza’s students are registered for SkillsUSA, all CCT students are encouraged to join the program. The Spartans traveled to Aurora in the CTE Activity Bus, provided by CTE Partnership Coordinator, Danny Showers. Upon arrival at TIC, students were welcomed with a breakfast bar, providing them with energy they would need throughout their day. Following an opening speech given by SkillsUSA State Director Julie Rife, high school and post-secondary students from across Colorado attended breakout sessions specific to their chapters. TJ began with a session based on the SkillsUSA Chapter of Excellence Program. Last year TJ was the only school honored as a Chapter of Excellence in the gold level at the state conference. This session trained new students on writing SMART (Specific, Measurable, Achievable, Realistic, Timely) Goals, which TJ’s officers will be producing later in the year in attempt to keep their title. Students then moved on to their second session, which included a tour of the TIC Center. During this tour, Spartans got to experience what typically goes on at this year’s location, including the construction that takes place within TIC. After lunch, TJ attended their last session, focused on this year’s SkillsUSA theme, “Job Ready Day One.” Because over twenty percent of new hires get let go from a job within their first ninety days, a presentation was given to all SkillsUSA members about how to keep a job long term, especially by keeping up professionalism and preparation in effort to enforce this year’s theme. This year’s SkillsUSA Leadership Conference provided Spartans a brand new experience with other members from across the state, unlike previous years, with more involved presentations. Hopes are high that the new leadership skills the officer team gained will benefit the chapter in the months ahead.